Home / 2013 / So How Long Should I Store That Bottle??? But here’s the real truth – there is no way to know ‘how long’ a wine will ‘last’ when you lay it down – period. I’ve had wines that I ‘thought’ would age beautifully for 10-15 years only to be unpleasantly surprised that they didnt )-: And on the other hand, I’ve dug through the cellar and found bottles that I was certain were ‘dead’ only to find them not only alive, but drinking beautifully beyond their life expectancy. To me, laying down a wine for the long term should be done for a couple of reasons. If a wine has great fruit but is overly tannic, time will probably (but not definitely) benefit that wine. Over time, the tannins will polymerize (grow into longer chains) and these longer chains are less astringent and bitter than shorter chain tannins. This assumes that you are somewhat tannin-averse and want to see your wine move in this direction. 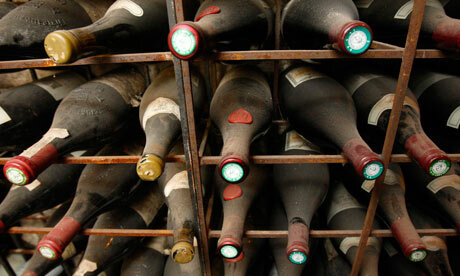 It is also beneficial to put away wines that have ‘sentimental value’ to you. I have stashed away a couple of bottles of different wines as ‘momentos’ of a special day, a special event, a special year, etc. Will these ‘improve’? Who knows – but I’ll enjoy opening them up and ‘reliving’ something from the past. Thanks for your comments. Storage conditions certainly do play a part in aging a wine in bottle, and by storing a wine in cooler conditions, you actually ‘slow down’ the aging process, somewhat preserving the wine as it currently is. That said, if a wine is not made in an ‘age-worthy’ manner, it won’t necessarily benefit from this process. Thank you for this post. You don’t mention storage conditions. Isn’t it more likely the wine will benefit from age if it is stored in cool, humid, dark conditions? I haven’t experimented with room temperature wine storage, but then again, I can rarely wait ten years to taste most of the wine I purchase. P.S. Love your blog. It never disappoints.